Yemen went through major changes in the past few years. It has been considered a poor country that is still suffering until this day. The people of Yemen attempted to adjust the conditions they live in, however they have not received the results they wanted. Two main influential attempts to make a difference are the reasons behind the major changes in Yemen. It all began with the Yemeni revolution in 2011, followed by the Houthis or “Ansarullah” influence over Yemen leading to the Saudi American aggression on Yemen. 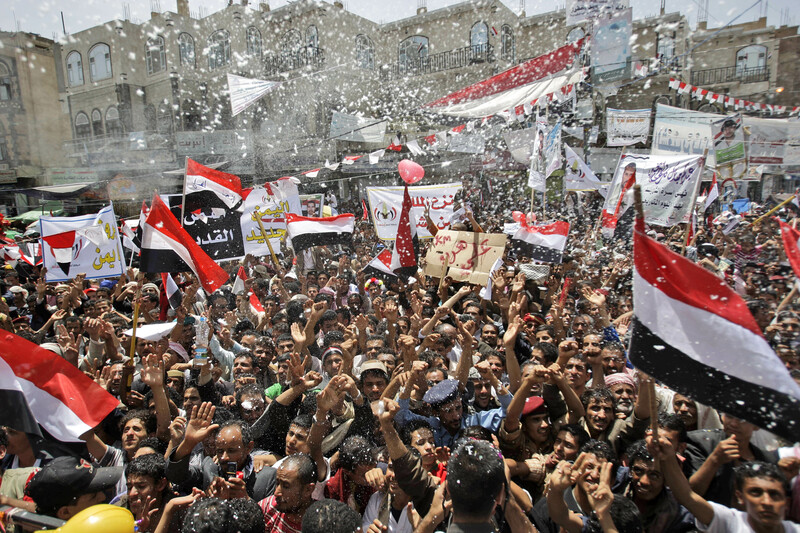 First, the Yemeni revolution began in January 2011, influenced by the Arab Spring protests such as the Tunisian and Egyptian uprisings. The Yemeni people decided that they can no longer bear corruption that result in their hardships. Yemenis were provoked to go out in protests due to unemployment high rate, economic conditions and the government’s proposals to modify the constitution of Yemen. The protesters were angry at the government for making them live under such conditions, and soon they realized that the first step to change things is by ousting the Yemeni president “Ali Abdullah Saleh”. The Yemeni government wanted to modify the constitution of Yemen by expanding the ruling time of Saleh. One of the most major demonstrations was held in the capital Sana’a with over 16,000 people expressing their rage on January 27. As a consequence of the protestors’ determination to end his presidency, he announced that he will not nominate himself as a president or inherit his presidency to his son in the year of 2013. On February 3rd, many protestors gathered in the governorates of Sana’a and Aden reaching a considerable number of furious voices calling for termination of oppression and corruption. The day was called a “Day of Rage” called for Tawakol Karman, one of the major contributors of the revolution. On the same day, a pro-government rally was held in the capital Sana’a by armed members of the General People’s Congress as well as other protestors. On February 18, Yemenis went out on demonstrations in Taiz, Aden and Sana’a and named the day a “Friday of Anger”. On a “Friday of no Return” which marks the 11th of March, Yemenis gathered in the city of Sana’a to demand Saleh’s ousting, and they have been dealt with by force causing the death of three people. Other cities of Yemen such as Al-Mukalla also participated, where one person faced death. On March 18, the day called “Friday of Dignity”, the Yemeni government committed genocide against the Yemeni protestors by firing upon them, resulting in the deaths of 52 and forcing them to choose resignation with no other options. Saleh agreed to sign a Gulf Cooperation Council deal in late April, however he backed away three times hours before the scheduled signing. After the third time, the GCE stated that they will suspend their intervention to rectify in Yemen. Sheikh “Sadiq Al-Ahmar” is the head of the Hashid tribal federation; he made a decision of direct intervention after Saleh’s refusal to cooperate. He supported the opposition and his armed force came into combat with the security forces loyalists in the capital of Sana’a. This resulted in heavy street clashes containing artillery and mortar shelling. On June 3, an explosion broke out in a mosque, targeting the presidential compound consisting of high-level government officials, including Ali Abdullah Saleh. The Yemeni ex-president was severely injured and traveled to Saudi Arabia for treatment. The Vice President “Abd Rabbuh Mansur Hadi” took place as president the next day during Saleh’s absence. The news made the crowds celebrate, but Yemeni officials expected his return and that his absence in the office is only temporary. Furthermore, the protestors requested the formation of a transitional council with the goal of transferring power to a caretaker government. However, their request was denied in early July. As a consequence, the formation of a 17 member transitional council was announced by groups of the opposition, but other members of the opposition stated that this council does not represent them and that this was not their plan for a developed Yemen. Saleh eventually signed a power-transfer agreement managed by the Gulf Cooperation Council in Riyadh on the 23rd of November. His power would be transferred to his Vice-President, Abd Rabbuh Mansur Hadi, within a period of 30 days and dismiss his position as president by February 2012. Saleh exchanged his presidency with his immunity from prosecution. The GCC deal was accepted by some protestors, however it was denied by many including the Houthis or “Ansarullah”. On 21 of February of the year 2012, Yemen encounters a new representative or president after 33 years of Saleh’s ruling. A presidential election was held with Hadi being the only one nominated; unopposed. The oath of office had been taken by Hadi on the 25th of February, 2012. On the same day, Saleh came back to attend the inauguration of Hadi. After months of protests since it all began in January, the protestors did achieve their goal of ending Saleh’s 33 year ruling period. However, many were not convinced that the revolution has stopped at this point. 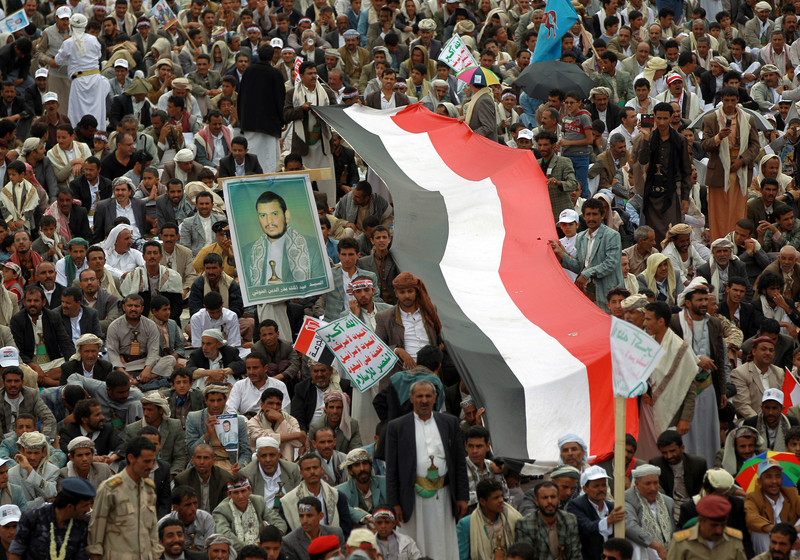 Their main aims of the demonstrations were not fulfilled, except for one which is getting rid of Saleh. The government was still the same, corruption was still wide spread, no major effects on economic conditions and the unemployment high rate remains. To sum up, the 2011 revolution achieved success, but not yet completely. The second major attempt by Yemenis to make a difference in the suffering they have to encounter on daily basis is by the Houthi or “Ansarullah” movement. Ansarullah first originated in the governorate of Saada, northern Yemen. It was founded by Hussien Badreddin Al-Houthi in 2004 and one of its goals was to overthrow the corrupted government and the president Ali Abdullah Saleh. The formation of the movement is a result of foreign intervention such as the Saudi ideologies influence over Yemen as well as the western dominance in Yemen. “Supporters of God” aka Ansarullah, also participated in the 2011 Yemeni revolution and the National Dialogue Conference. In the NDC, they rejected the provision of dividing Yemen into six provinces because it would split Yemen into poor and wealthy regions in addition to the fact that it will weaken Yemen. They withdrew from the NDC after the assassination of their representative in the NDC. Ansarullah are led by Abdul-Malik Al-Houthi, the brother of Hussien, since he got killed in 2004 by Yemeni army forces. The Yemeni government waged a war on Ansarullah that began in 2004 after an incident during Friday prayers in a mosque that Saleh attended, in which a group of people chanted with their anti-American and anti-Jewish slogan. The president feared that soon enough, they will be chanting “death to the president of Yemen”. He responded by inviting Hussein to the capital Sana’a for a meeting, but Hussein declined because nothing guaranteed his safety. As a consequence, the president sent several army forces to arrest Hussein and officially declaring war against Ansarullah. The war finally ended in 2010 by a ceasefire agreement. The revolution went on with its new leader, and Ansarullah and their allies made a lot of progress and attracted more followers. They gained more territory and by the the 9th of November, Ansarullah controlled the governorates of Saada, Al-Jawf and almost Hajjah. Eventually, they succeeded in making advance in Hajjah aiming for their next target, the capital Sana’a. By the 21 of September, Ansarullah controlled government buildings and a radio station in parts of Sana’a. In the meantime, the Yemeni government increased petroleum derivatives prices causing inflation. This resulted in demonstrations and marches against the Yemeni government’s decision adding to the sufferance of people who cannot even afford life necessities. The demonstrations consisted of mostly Ansarullah and their followers. They announced their three demands through their marches which are ending the petroleum derivatives, implementing the National Dialogue outcomes and modifying the government. The government responded to only one of their demands, returned the original prices of petroleum derivatives. The protestors continued with their marches, but they only received indifference as a feedback. Finally, the protestors made the decision of attain their demands by force. They got involved in clashes with some Yemeni forces protecting the presidential palace. President Hadi was in the palace during the fight, but he was not harmed. On 20 January in 2015, Ansarullah seized the presidential palace in the capital Sana’a, overthrowing the Saudi-backed government. Hadi as well as all the other ministers announced their retirement and Hadi was kept under custody in the presidential palace. During that time, Ansarullah announced that they wanted the formation of the new government to involve every segment of the Yemeni society to create a government of all and for all. They began a National Dialogue with the representative of each party participating. Ansarullah announced its Revolutionary Committee on the 6th of February, but the dialogue was not interrupted. Furthermore, Hadi attempted to escape the palace and traveled to the coastal authority governorate of Aden, declaring his presidency excluding any elections from there and that the new temporary Yemeni capital is Aden. On the 20th of March, the Al-Badr and Al-Hashoosh mosques were the targets of suicide attacks during midday prayers. The Islamic State of Iraq and the Levant took responsibility. The attack was the deadliest in Yemen’s history as it has resulted in the killing of 142 worshippers and wounded more than 351. In a televised speech, on the 22nd of March, Abdul Malik Al-Houthi accused the US and Israel and their allies of several Arab states of providing financial assistance for terrorist groups operating in Yemen. The next day, Ansarullah fighters traveled to Aden to put an end for Hadi’s unjust announcement and his fake new government. The resigned president Hadi requested a foreign intervention. As a result, the Saudi-led coalition consisting of 9 countries launched its fighter jets to wage a war on Yemen on the 26th of March, calling it the “Decisive Storm”. Furthermore, the coalition consisted of fighter jets from Egypt, Morocco, Jordan, Sudan, the UAE, Kuwait, Qatar, Bahrain, Saudi Arabia as the leader and the US providing intelligence logistical support. It also offered its search and rescue for captured coalition pilots. It accelerated and boosted the sale of weapons to coalition states, including international forbidden weapons such as cluster and phosphorus bombs. The US State Department, John Kirby, received a question if the usage of cluster bombs is legitimate, and he told the reporters “if used appropriately”. Somalia offered its airspace, territorial waters and military bases for the coalition pilots. The country of Pakistan was also called to jointed the coalition to intervene on land, but the its parliament voted to remain a neutral country. In addition, some countries are providing financial assistance such as Britain. They claim that their military intervention will only target the Houthis and the forces loyal to Ali Abdullah Saleh. Then Saleh announced his alliance with Ansarullah. The Saudi American aggression has worsened the humanitarian condition in Yemen severely causing a “humanitarian catastrophe”. The reckless and indiscriminate targeting is against international law, however, that did not prevent the Saudi American aggression from waging an unmerciful genocide on the governorate of Saada by the reckless and indiscriminate bombardment. They declared Saada a military target, disregarding all the innocent civilians and public and private properties that settle there. The UN declared a “level-three” emergency which is the highest UN emergency level for Yemen that lasts for six months. According to the UN special representative of the secretary-general for children and armed conflict stated, that 75% of the hundreds of children killed in Yemen are victims of the Saudi American aggression. Moreover, Human Rights Watch criticized the UN Security Council repeatedly for remaining almost silent towards the crimes committed by the brutal aggression against the Yemeni people. According to UNICEF Yemen, “19.3” million people in Yemen are in need of access to safe drinking water”. UNICEF also spoke about the number of children killed which is more than 2000 in almost a year on conflict. According to “Jeff Smith”, a nuclear physicist and former IAEA inspector, “a video received from Yemen, believed to be taken May 20, 2015, of an explosion, when analyzed by nuclear weapons experts is, by high probability, a neutron bomb that could only have been an Israeli attack”. According to an OCHA analysis regarding the condition in Yemen, about 1.80B is needed for a funding requirement, 14.40M are food insecure people and 2.50M are internally displaced persons. The conflict in Yemen is faced with international silence. Saudi Arabia opened new channels with the same names original Yemeni channels held to falsify the real news such as the achievements of the Yemeni army and the people’s committees. Since day one of the aggression, the coalition besieged all of Yemen which caused a shortage of several medicines. Hospitals have gotten to the point where even oxygen was not available. As a consequence, made Yemeni lives were in danger, even if the injury or sickness is not that severe. Poverty immensely increased, adding to the sufferance of most Yemenis. In conclusion, the people of Yemen have sacrificed their safety and security for an independent Yemen. Until today, the Saudi American aggression has not been stopped from committing massacres and genocides against innocent civilians. The usage of international forbidden weapons is considered “appropriate” in Yemen. Humanitarian laws did not prevent the Saudi American aggression brutality and inhumanity. This war is what the world charges Yemen for liberty. Malak Ali is a female journalist from Sana'a. She has been working with multiple english newspapers in Yemen, and is a regular contributor and source for th YRW.